The opportunistic food-borne gram-positive pathogen Listeria monocytogenes can exist as a free-living microorganism in the environment and grow in the cytoplasm of vertebrate and invertebrate cells following infection. The general stress response, controlled by the alternative sigma factor, σB, has an important role for bacterial survival both in the environment and during infection. We used quantitative real-time PCR analysis and immuno-blot analysis to examine σB expression during growth of L. monocytogenes EGD-e. Whole genome-based transcriptional profiling was used to identify σB-dependent genes at different growth phases. We detected 105 σB-positively regulated genes and 111 genes which appeared to be under negative control of σB and validated 36 σB-positively regulated genes in vivo using a reporter gene fusion system. Genes comprising the σB regulon encode solute transporters, novel cell-wall proteins, universal stress proteins, transcriptional regulators and include those involved in osmoregulation, carbon metabolism, ribosome- and envelope-function, as well as virulence and niche-specific survival genes such as those involved in bile resistance and exclusion. Ten of the σB-positively regulated genes of L. monocytogenes are absent in L. innocua. A total of 75 σB-positively regulated listerial genes had homologs in B. subtilis, but only 33 have been previously described as being σB-regulated in B. subtilis even though both species share a highly conserved σB-dependent consensus sequence. A low overlap of genes may reflects adaptation of these bacteria to their respective environmental conditions. Stress responses in bacteria are mediated by alternative sigma factors and other regulatory proteins. In the gram-negative bacterium E. coli, extensive studies have identified the rpoS gene as the factor orchestrating cellular responses to stressful conditions [1, 2]. In the low G+C content, gram-positive genera like Bacillus, Listeria and Staphylococcus the alternative sigma factor, σB, is involved in coordinating cellular stress responses [3–8]. In B. subtilis, members of the σB regulon contribute to the microorganism's response to environmental stress conditions such as starvation in stationary growth phase, heat, osmotic stress, repeated freezing and thawing or acid and alkaline shock [9–11]. More than 100 stress-responsive genes have been assigned to be under the control of the σB transcription factor [12, 13]. The activity of σB in B. subtilis is known to be post-translationally regulated by a complex network composed of two sequentially linked partner-switching modules . The sigB operon consists of sigB itself and seven regulators of sigB (rsb) genes. These regulatory genes can either negatively (e.g. rsbW, rsbX) or positively control σB activity (e.g. rsbV). Under normal conditions σB is inactivated by direct binding by the anti-σB protein RsbW. Induction of the σB regulon is effected by sequestration of the RsbW protein (anti-σB) by RsbV (anti-anti-σB) thus releasing of the previously complexed σB protein, which then forms the holoenzyme with the core RNA polymerase to transcribe genes with σB-dependent specificities [7, 14, 15]. Comparative analysis reveals that there is considerable variation in the genome organisation of genes comprising sigB operons in B. subtilis and other gram-positive bacteria [16, 17]. The overall organization of genes is best conserved between L. monocytogenes, L. innocua and B. subtilis but truncated versions of the sigB operon lacking the rsbR, rsbS, and rsbT are found in B. anthracis, S. aureus and S. epidermidis. Given that these bacteria occupy different ecological niches it would be interesting to examine the extent of conservation of the σB regulons amongst these bacteria. L. monocytogenes is a ubiquitous gram-positive, facultative intracellular bacterium causing severe disease in both animals and humans. L. monocytogenes is well-known for its robust physiology. It is capable of growth at refrigeration temperature, low pH and at high osmolarity. However, relatively little is known about the role of adaptive physiological response in promoting survival and growth of the bacterium in hostile environments. Several studies demonstrated that a L. monocytogenes sigB deletion mutant was more susceptible to environmental stresses such as acid stress , osmotic stress [3, 19] and carbon starvation [8, 19]. A strong σB-dependence has been shown for the osmotic induction of both opuC (encoding an ABC carnitine transporter) and lmo1421 (encoding a putative transporter) , and for one of the two prfA promoters upstream of prfA . Furthermore, a deletion in the sigB gene has been reported to affect the virulence phenotype of L. monocytogenes in murine and guinea pig models of infection [21, 22]. Recently, 55 σB-regulated genes have been identified using a customized 208-gene microarray comprising of genes predicted to harbor σB-dependent promoters . Even though entry into stationary phase in BHI medium is known to induce σB activity, the exact nature of the inducing signal remains unknown. In this study we monitor σB expression at different stages of growth using quantitative real-time PCR analysis (qRT-PCR) and immuno-blot analysis at different stages of growth. We examined for genes of the sigB regulon expressed at different bacterial growth phases using whole-genome based transcriptome profiling. A total of 216 σB-dependent genes of which 105 were positively and 111 genes negatively regulated were detected in the presence of the alternative sigma factor σB. Using temporal transcriptome profiling, we identified 216 genes in L. monocytogenes EGD-e as being differentially regulated by the alternative sigma factor, σB, at four different time points of bacterial growth (3 h, 4 h, 8 h and 16 h) in brain heart infusion (BHI) broth. These correspond to middle and late exponential phases (3 h and 4 h) as well as early and late time points of stationary phases (8 h and 16 h) of growth, respectively (see Additional file 1, Fig. 4S). We assayed σB expression at the various bacterial growth phases and found that its expression is highly induced at 3 h and 4 h both by qRT-PCR (Fig. 1A) and by monitoring protein expression levels using a σB-specific polyclonal antibody (Pane-Farre et al., manuscript in preparation) in immuno-blot analysis (Fig. 1B). Expression of the σB regulatory protein decreases at the 8 h time point and is lowest at 16 h, the last time point examined in this study (Fig. 1). This expression pattern suggests that in L. monocytogenes, σB probably reflects a requirement in regulating responses to environmental changes during rapid growth. (A) Copy number of the sigB gene in L. monocytogenes EGD-e grown in BHI medium for 3 h, 4 h, 8 h and 16 h. Data shown here is representative of three independent biological replicates. (B) Immuno-blot analysis quantifying σB from L. monocytogenes EGD-e at different growth phases. Proteins were isolated from cultures of L. monocytogenes EGD-e grown for 3 h (lane 1), 4 h (lane 2), 8 h (lane 3) and 16 h (lane 4) in BHI at 37°C and σB was detected using rabbit polyclonal anti-serum produced against S. aureus COL σB. The L. monocytogenes ΔsigB deletion mutant (lane 5) was used as negative control and S. aureus COL (lane 6) was used as positive control for specific binding of the antibody. Molecular masses (in kilodaltons) of prestained SDS-PAGE standard marker (Bio-Rad) are indicated on the left and σB is marked on the right. To demonstrate that σB acts as a transcriptional activator we examined the σB-dependence of genes seen in the microarray studies by cloning upstream regions from 41 σB-up regulated genes and fusing them to a promoterless β-galactosidase gene (bgaB) derived from B. stearothermophilus on plasmid pSOG30222 (see Additional file 1, Fig. 2S). Of these 41 genes, 33 promoters harbored canonical σB-binding sequences while 8 had no putative σB-binding sequences but were nevertheless considered to be σB-regulated on the basis of transcriptome analysis. We verified the dependence of the promoter regions on σB by conducting gene fusion assays. Under the growth conditions described in Material and Methods, we found between 2- and 230-fold more activity in the wild type as compared to the ΔsigB mutant strain. Five promoters with putative σB-binding sequences were slightly activated by σB, but did not fulfill the criteria for being σB-dependent (lmo0043, lmo1433, lmo2067, lmo2231 and lmo2485). In summary, out of 41 promoters tested, we confirmed 36 promoters (~88%) for σB-dependency (see Additional file 1, Table 1S). Based on the results presented here we infer that the σB regulon comprises 216 transcription units. Using the pattern GTTT-N12–17-GGGWAW for σB-binding motif search, we investigated the upstream sequences of the putative 216 σB-dependent genes and were able to detect σB-binding motifs in 68 of the 216 upstream sequences inspected (see Additional file 1, Table 1S and Table 2S). The analysis successfully identified 35 of 54 previously known σB-binding sites . A high proportion of predicted σB-binding sites were located upstream of the gene, but in five cases predicted sites were located within the coding sequence (lmo0911, lmo0994, lmo2463, lmo2485 and lmo2724). 105 genes were positively controlled by σB and correspond to 19 operons, encoding 48 genes as well as 57 single-gene transcription units (see Additional file 1, Table 1S). Of these 76 transcription units, 51 harbor a single consensus σB-binding sequence, 2 transcriptional units have two σB-binding sequences each and the remaining 23 do not contain consensus σB-binding sequences. These are likely to encode gene products whose expressions are probably either controlled by σB-dependent regulatory genes or whose RNA is stabilized by RNA binding proteins whose activities are σB-regulated such as Hfq. Of the 111 genes down regulated during σB expression, 28 genes were organized in 11 operons and 83 were single genes. We identified only 13 consensus σB-binding sequences among the 111 σB-down regulated genes (see Additional file 1, Table 2S). σB-dependent down regulated genes were solely found in both the stationary phase growth conditions tested, but were not detected in bacteria at the exponential growth phase. It is likely that σB regulates expression of genes that negatively affect (regulate) the central metabolism of the cells, as the cells move away from active growth. Our studies suggest that genes comprising about 7.6% of the genome of L. monocytogenes are regulated directly or indirectly by σB. Chromosomal distribution of the σB-dependent genes revealed an uneven distribution over the genome of L. monocytogenes (Fig. 2). 72% of the σB-positively regulated genes (76 of 105 genes) were located on the first third of each replicore. It has been suggested that expression of genes located near the oriC is higher in growing cells compared to genes located around the terminus . Interestingly, the majority of σB-negatively controlled genes (82%) were concentrated on the left replicore. Chromosomal distribution and orientation of σB-differential regulated genes. The first circle represents the scale in kb starting with the origin of replication at position 0. The second circle shows the distribution of coding sequences (CDS) of the leading and lagging strand in gray including σB-dependent up regulated genes in green and σB-dependent down regulated genes in red. The third circle indicates the COG classification for each gene and distribution of COG classes within the genome. Colour scheme and categories were chosen to the convention of the COG database. The innermost circle displays the GC skew ([G+C]/[G-C]), with values greater than zero in purple and less than zero in orange. For GC skew analysis we applied a sliding window of 1000 bp with an overlap of 500 bp. The figure was drawn using the GenomeViz software . Considering the candidate genes identified in our study, the σB regulon in L. monocytogenes comprises genes involved in metabolic functions including glucose and amino acid metabolism, solute transporters, permeases, ABC transport systems, general stress proteins, cell wall proteins, bile resistance and exclusion and transcription factors (Fig. 3). The total number of σB-regulated genes might be underestimated since the transcriptional activity of the strain was monitored only under growth conditions in complex BHI media during the middle and late exponential and the early and late stationary phase. In a similar study that examined the size of the regulon controlled by the master regulator of virulence PrfA in strain EGD-e, Milohanic and colleagues  reported a subcategory of 53 genes harboring σB-like binding sequences in their respective promoter regions. Here, we confirm that 45 of those 53 genes (85%) are indeed σB-regulated genes. An earlier study reported 55 σB-regulated genes identified during growth in the stationary phase (using BHI) and under salt stress . Only 35 of the 53 (64%) genes of that study were detected here. However, that study employed a different strain 10403S and used sequences derived from the genome sequence of strain EGD-e as the basis for the design of the array. Functional COG categories of σB-differential regulated genes of L. monocytogenes EGD-e obtained from temporal transcriptome profiling experiments. Functional categories were determined using COG for L. monocytogenes provided by NCBI . The figure was drawn using the Augur software . In ongoing studies, we examined the global transcriptional response after different shock conditions for L. monocytogenes  and found 92 heat stress induced genes all of which are present among the 105 σB-positively regulated genes found in this study. This suggests the potent role of σB in growth under hostile environmental conditions. Several genes, including the OpuC, ABC-like transporter (lmo1425-1428) that are linked to choline, glycine-betaine and carnitine uptake, have been shown to contribute to protection against osmotic stress in L. monocytogenes . In agreement with these results, we confirmed the presence of a σB-binding sequence and strong σB-dependent activity in the promoter region preceding the opuCA (lmo1428) gene [20, 27]. We also found that genes coding for a transport system for di- and tripeptides, DtpT (lmo0555)  and a peptidase T (lmo1375), were positively regulated by σB. Degradation of peptides to their constituent amino acids can serve either as osmoprotectants (glycine, proline), or substrates for other amino acids or even as a source of energy. A member of ornithine cycle, a putative arginine deiminase (lmo0043) based on sequence homology, known to catalyse the conversion of L-arginine to L-citrulline and ammonia was observed to be under σB control. The ammonia metabolized probably serves as a protectant in other bacteria against acid damage , and the citrulline produced might be used to generate ornithine. Further a operon comprising the genes for lmo1421 and lmo1422 encoding the bile exclusion system BilE was confirmed to be σB-regulated . Together with the bile salt hydrolase bsh (lmo2067) , we identified three genes that contribute to neutralization of bile in the gastrointestinal tract. In this study, we confirmed the extreme sensitivity of the ΔsigB mutant to low acid conditions  and bile  (see Additional file 1, Fig. 1S and Fig. 3S). The presence of specific genes for mediating bile- and acid-resistance in L. monocytogenes probably reflects niche-specific adaptation of this species to colonize the gastrointestinal tract of mammalian hosts. The largest set of hitherto undescribed σB-dependent genes is linked to the biosynthesis of carbohydrates. Thus σB-dependent activation of genes encode putative glucose, mannose- and fructose specific uptake systems (lmo0169, lmo0781-784) are coupled to the up regulation of several enzymes involved in glycolysis including two dihydroxykinases and a dihydroxyacetone kinase phosphotransfer protein (lmo2695-2697) as well as phosphoglycerate mutase (lmo2205). Furthermore, genes coding for NagA (lmo0956) and NagB (lmo0957) are involved in the cell wall metabolism leading to the generation of glucosamine-6-phosphate via acetylglucosamine-6-P-deacetylase (NagA) and further on to fructose-6-phosphate using NagB, a glucosamine-6-phosphate isomerase . Fructose-6-phosphate can act as initial precursor for the glycolysis pathway. It can be suggested that use of cell wall components such as aminosugar supports metabolism during stress situations, when other energy rich compounds are not accessible. Genes encode enzymes of the pentose phosphate pathway including glucose-1-dehydrogenase (lmo0669) as well as the ribose-5-phosphate isomerases (lmo2674 and lmo0736) and a ribulose-phosphate-3-epimerase (lmo0735) show σB-dependent regulation. The ORF lmo0736 belongs to the group of genes without a homolog in L. innocua. Comparative genome analysis including the recently published L. monocytogenes strains [34, 35] showed that both lmo0735 and lmo0736 lie within a region that is specific to L. monocytogenes. In addition, we found components of pyruvate metabolism pathway to be induced, as seen by the activation of a pyruvate oxidase (lmo0722) and an acetate kinase (lmo1168) that can generate acetyl-CoA to enter into the tricarboxylic acid (TCA) cycle. Finally, we identified two putative NAD-dependent dehydrogenases (lmo0794 and lmo2391) and a NADPH-dependent quinone reductase (lmo2573), both of which were highly up regulated and are probably involved in electron transport and generation of cellular energy for the bacterial cell. A functional overview of σB-up regulated genes is given in Fig. 3 indicating a strong preference of categories for carbohydrate/amino acid transport and metabolism as well as for cell wall/membrane biogenesis. Several transport processes for a range of inorganic ions in L. monocytogenes are under σB control. The gene encoding lmo0405 resembles low affinity phosphate transporter pitA of E. coli which is involved in Zn2+ efflux when the ion reaches highly toxic external concentrations . In addition to phosphate uptake, the phoU gene (lmo2494) encoding a negative regulator of the phosphate regulon was induced by σB. To regulate the concentration of heavy metal cations such as cadmium, zinc or cobalt, the bacterium might uses another putative transporter lmo2231 that has similarities to CzcD, a proton-driven antiporter system for these divalent cations . The ORF encoded by lmo2602 is similar to MgtC of M. tuberculosis and S. typhimurium. MgtC is reported to support bacterial intracellular survival within the macrophages and increase the ability to grow in low Mg2+ environments . All three members of the universal stress proteins (Usp) of L. monocytogenes, namely lmo0515, lmo1580 and lmo2673 are up regulated by σB. Using two dimensional gel electrophoresis, Lmo1580 was recently identified, a protein which is induced during acid adaptation and acid stress in L. monocytogenes EGD-e . In E. coli, Usps are proteins that accumulate in cells during stationary phase and during a variety of stress conditions (heat shock, ultraviolet light, ethanol stress etc.) causing growth arrest in cells. Furthermore, Usp proteins are required for the management of DNA damage and are induced by mutations in the FtsK protein, a cell division protein located at the cell septa and which coordinates chromosomal dimer segregation during cell division resulting in the separation of the daughter cells. Here we demonstrate that in L. monocytogenes, FtsK (lmo1606) expression is also σB-dependent, suggesting coordinated expression with Usps to prevent chromosomal damage during cell separation. Genes regulated by the σB regulon mediating resistance to oxidative stress include a glutathione reductase encoded by lmo1433. For L. lactis it was shown that accumulation of intracellular glutathione conferred resistance to H2O2 . We also observed and confirmed that the expression of Hfq (lmo1295) to be dependent on σB in L. monocytogenes . The homolog protein in E. coli interacts with many regulatory sRNAs increasing e.g. the stability of the sRNA itself. Recently, it was demonstrated that a Δhfq mutant in L. monocytogenes EGD-e is sensitive to osmotic and ethanol stress, and is required for the expression of full virulence in the mouse model of infection . Furthermore, co-immunoprecipitation using Hfq-specific antiserum followed by enzymatic RNA sequencing revealed that Hfq is able to bind different sRNA molecules . Previously, Nadon and colleagues  provided evidence for σB-dependent transcription of the listerial prfA gene (positive regulatory factor A) that controls the expression of all known virulence genes. Considerable similarity was found between the second promoter sequence of prfA (prfAp2) 5'-TTGTTACT-N14-GGGTAT-3' and the consensus σB-binding sequence. To support their hypothesis, Nadon and coworkers  compared the phenotypes of a ΔprfAp1ΔprfAp2 and a ΔsigB ΔprfAp1 double mutant and showed that the loss of σB activity had the same effects as deletion of the prfAp2 promoter. As a result, expression of well-characterized PrfA-dependent virulence genes such as listeriolysin is induced under stress conditions. Furthermore, prfAp2 was recently confirmed to be under direct control of σB in a growth phase dependent manner . In this study, we were unable to demonstrate significant expression of inlAB genes, whose expression is PrfA-dependent. It has been previously reported that the ΔsigB mutant  is affected in epithelial cell invasion [22, 44, 45] as well as in gastrointestinal infection of guinea pigs . Here we detected a number of genes predicted to encode cell wall-associated proteins that may adhere to collagen (lmo0880 and lmo2085), two other LRR-containing internalin proteins (lmo0263 and lmo0610) and predicted cell membrane proteins (lmo0591, lmo1261, lmo2484 and lmo2602) all of which are potential candidates for epithelial cell invasion. We also noted that the bsh and bilEAB genes whose transcription was previously shown to be PrfA-dependent [30, 46], were significantly regulated (see Additional file 1, Table 1S) by σB as previously reported [31, 47]. 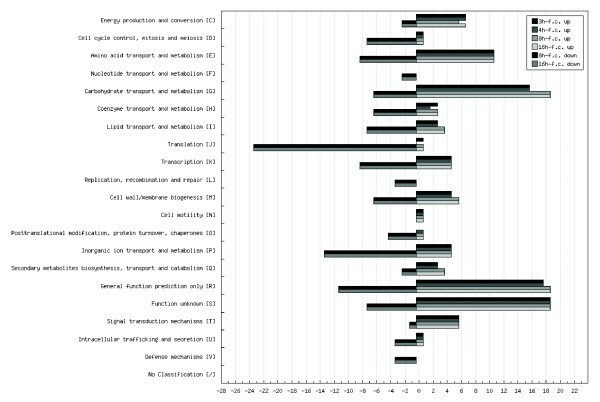 The data suggested strain-dependent differences in responses to various stress stimuli in the various L. monocytogenes strains, an observation that has previously been documented . Analysis of the expression profiles deriving from the early and late stationary growth phase revealed 111 genes down regulated by σB. COG analysis of σB-repressed genes (Fig. 3) included different categories which are e.g. involved in translation (initiation factor infC, elongation factor tsf, ribosome recycling factor frr, several ribosomal genes: rpsT, rpmA, rplU, rpsD, rpsI, rplM, rpsH, rplN, rpsC, rplV, rpsS, rplB and rplD and t-RNA synthetases: lysS, alaS and hisS). Other categories of repressed genes were involved in cell cycle control (smc), cell division (ftsH, ftsW ftsZ, ftsQ, ftsI, ftsL, ftsX, ftsE and cell division inhibitor minD), cell wall biogenesis (mreD, iap and spl) and inorganic ion transport for manganese, copper and cobalt (mntH, mntBCA, lmo2062 and cbiQ) (Fig. 3 and see Additional file 1, Table 2S). σB repression of ribosomal genes rlpD, rpsC, rplW and rpsJ and genes encoding cell wall lytic enzymes as well as ion binding proteins was previously reported for B. subtilis . Here we report that σB regulates many aspects of growth, such as those involved in translation and cell division processes in L. monocytogenes, during growth in stationary phase, probably representing a physiological response to limiting nutrients. Regulation of these genes by σB has been observed before for other gram-positive bacteria . The presence of a low number of consensus σB-binding sequences (13) in down regulated genes as compared to 55 for σB up regulated genes indicates that repression by σB is often indirect and probably uses other signal transduction pathways and transcriptional regulators. Since detailed information about the role of σB as a negative regulator is scarce, further studies addressing this topic are needed. 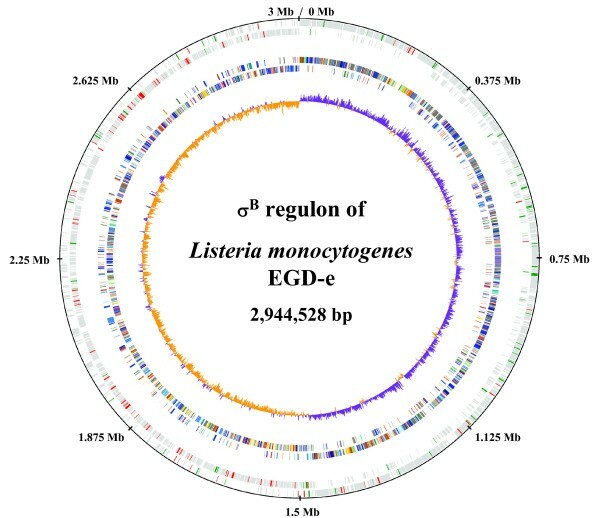 It was also of interest to determine how many of the σB regulon members of L. monocytogenes EGD-e were present/absent in the closely related non-pathogenic L. innocua as this is a free-living bacterium existing in the environment. Using the σB promoter consensus-directed search (GTTT-N12–17-GGGWAW), determined for L. monocytogenes, a majority of genes (~80%) were found in L. innocua, which were preceded by this sequence motif and consequently bear a significant homology to orthologs in L. monocytogenes. Thus the σB regulon appears to be highly conserved between these two listerial species. Ten genes predicted to be involved in the stress response of L. monocytogenes had no orthologs in the non-pathogenic L. innocua strain. These include lmo0819 encoding a hypothetical protein as well as lmo2387 encoding a protein which is a member of a large and ubiquitously occurring family of voltage-gated sodium channels (CLC) in bacteria and vertebrates . Other genes without a homolog in L. innocua were lmo0263 (Internalin H) and lmo2085, both encoding cell wall proteins with an LPXTG motif; lmo0736, which is similar to Ribose 5-phosphate isomerase; lmo2157 which encodes the previously described SepA required for septum formation, and lmo2671 encoding a lactoylglutathione lyase that catalyzes the initial step of the glyoxal pathway. Furthermore, two non-orthologous genes were identified as transcriptional regulator genes, lmo0445 and lmo2672. The gene product of lmo0445 harbors a Mga helix-turn-helix domain (Pfam prediction E-value 4.4 e-29). The second transcriptional regulator (lmo2672) belongs to the AraC family and could also be involved in acid response. In E. coli, low pH regulation is also dependent on two AraC-like regulators, GadW and GadX . The gene products of lmo0447 and lmo0448, GadA and GadE, have been shown to be involved in acid resistance [52, 53]. In our study, we confirmed that lmo2067 (bile salt hydrolase, bsh) [31, 32], another L. monocytogenes specific gene locus, is regulated by σB. The sigB operon in L. monocytogenes and B. subtilis are highly conserved with respect to structure and sequence similarity among the low G+C containing bacteria . Additionally, the proposed σB-binding consensus sequence is highly similar between these two species . Of the 105 σB-up regulated genes described in this study, we found 95 with orthologs in L. innocua and 75 with orthologs in B. subtilis through similarity searches (see Additional file 1, Table 1S). Of these 75 orthologous genes in B. subtilis, 33 have been previously reported to be σB-dependent in B. subtilis [12, 13]. These include well-characterised σB-dependent genes such as, the members of the sigB operon itself and the osmoregulatory opuC operon (opuCC, opuCB), csbD, several universal/general stress genes and an arginine deiminase involved in acid tolerance . This indicates conservation of a basic core set of stress responsive genes between these two species. However, a larger set of genes are either disparately controlled between these two species or specific to L. monocytogenes. The former include genes encoding for transporters of di- and tripeptides, PTS systems, some genes involved in metabolism such as ribose-5-phosphate isomerase and acetate kinase as well as a large number of hitherto uncharacterized genes in B. subtilis. Examples of probable niche-specific σB-regulated genes in L. monocytogenes include Internalin H, LPXTG- and LysM-motif containing cell wall proteins, putative collagen binding proteins and bile salt resistance and exclusion proteins [30, 46]. In addition, many of the σB-dependent effects are probably under the control of a secondary transcription regulatory circuit. We hypothesize that the current size of the σB regulon, comprising 216 up- and down-regulated genes and representing approx. 7.6% of all genes in the listerial genome. This compares with 128 genes or 3.1% of the genes for B. subtilis , 28 genes or 0.5% of the genes of B. cereus  and 251 genes or 9.6% of the genes of S. aureus , indicating that the alternative sigma factor directly regulates large sets of genes in these microorganisms. σB however must also exert its effect on many genes in an indirect manner, i.e. through control of secondary regulator genes and by inducing genes whose products stabilize RNAs posttranscriptionally, e.g through Hfq. Additional studies employing a variety of stress stimuli and growth conditions will be required to generate a comprehensive catalogue of σB-regulated genes for L. monocytogenes. L. monocytogenes EGD-e  and its isogenic deletion mutant ΔsigB (chromosomal deletion of region 930.725 bp – 931.393 bp)  and S. aureus COL  were used in this study. Bacteria were grown in brain heart infusion (BHI) broth (Difco) at 37°C with shaking (see Additional file 1, Fig. 4S) and where required supplemented with erythromycin at 5 μg/ml. E. coli InvαF' cells (Invitrogen) were grown in Luria-Bertani broth (LB) containing 300 μg/ml erythromycin to select for the plasmid pAUL-A. pSOG30222 was selected on BHI containing 5 μg/ml erythromycin. All oligonucleotide primers for PCR amplification used in this report for cloning procedures are listed in the supplementary material (see Additional file 1, Table 3S). Standard molecular techniques were used for DNA manipulation . Plasmid DNA was transferred to E. coli InvαF' (Invitrogen) according to Hanahan . The electroporation protocol of Park & Stewart  was used for the transformation of L. monocytogenes strains EGD-e and ΔsigB. Quantitative real-time PCR was performed according to Chatterjee et al. . Briefly, total RNA were isolated  from the wild type L. monocytogenes EGD-e growing in BHI medium for 3 h, 4 h, 8 h and 16 h (see Additional file 1, Fig. 4S). Following cDNA production the probes were subjected to quantitative real-time PCR in a final volume of 25 μl using RealMasterMix kit (Eppendorf) according to manufacturer's instruction. A standard curve was generated for sigB (lmo0895) primer pair (see Additional file 1, Table 3S) using known copy number of genomic DNA from L. monocytogenes EGD-e. For the primer pair a negative control (water), RNA sample without reverse transcriptase (to determine genomic DNA contamination) and sample with a known amount of template copies (to provide efficiency of the reaction) were included as controls during cDNA quantification. The experiment was carried out for three independent biological experiments. To construct an E. coli vector expressing recombinant S. aureus σB appropriate DNA fragments were amplified using chromosomal DNA from S. aureus COL  and primers SigB_pPR_IBA1_for and SigB_pPR_IBA1_rev (see Additional file 1, Table 3S). The Bsa I digested DNA fragment was ligated into Bsa I digested pPRIBA-1 (IBA, Göttingen, Germany) to generate a Strep-tagged version of the protein. For overexpression of recombinant σB the respective vector was transformed into E. coli BL21(DE3)/pLysS and a single colony propagated in one litre LB-medium until the culture reached an OD540 of 0.4. Synthesis of the protein was induced by the addition of IPTG (1 mM). Cells were harvested two hours after induction. Purification of proteins was performed according to the recommendations of the manufacturer (IBA, Göttingen, Germany). Purified σB was used for the immunisation of rabbits (Pineda, Berlin, Germany). The anti-σB serum was subjected to antigen specific affinity purification (Pane-Farre et al., manuscript in preparation). Bacterial cultures in BHI were harvested after 3 h, 4 h, 8 h and 16 h of growth (see Additional file 1, Fig. 4S) by centrifugation at 5000 × g at 25°C for 10 min. Pellets were resuspended in PBS and cells were disrupted by using the Fastprep®-24 system (MP Biomedicals). Matrix B tubes were subjected to three 20 s bursts of agitation with breaks of 5 min on ice. Lysates were centrifuged at 13000 × g and supernatant containing released proteins was transferred to fresh tubes. The amount of protein in the various extracts was determined using a Bradford assay (Bio-Rad), and the fractions were stored at -20°C. Samples containing 12.5 μg proteins were separated by 12.5% SDS-PAGE, transferred to nitrocellulose membranes (Millipore) and probed with rabbit polyclonal anti-serum against S. aureus COL σB (Pane-Farre et al., manuscript in preparation). Detection was performed using horseradish peroxidase (Santa Cruz Biotechnology) -coupled anti-rabbit antibodies and the ECL kit (GE Health Care) as per the manufacturer's instructions. Microarray construction and expression profiling experiments were performed as previously described by Chatterjee et al. . Briefly, overnight cultures of L. monocytogenes EGD-e cells (wild-type and mutant) were grown in brain heart infusion (BHI) broth (Difco). Bacteria were diluted 1:50 in 20 ml fresh BHI and incubated using a 100 ml Erlenmeyer flask at 37°C with shaking (180 rpm, Unitron [Infors]). 0.5 ml aliqouts of bacterial liquid cultures were taken at 3 h, 4 h, 8 h and 16 h of growth (see Additional file 1, Fig. 4S) and treated with 0.5 ml RNAprotect (Qiagen) according to manufacturer's protocol prior to centrifugation. The cells were frozen and stored at -80°C. Total cellular RNA was extracted as previously described . The quantity of the isolated total RNA was determined by absorbance at 260 nm and 280 nm, and the quality assessed using the Agilent 2100 Bioanalyzer. The isolated total RNA was stored at -80°C until used. cDNA was generated and labelled with CyDyes (both Cy3 and Cy5 for each probe) using 3 μg of total RNA with CyScribe Post-Labelling Kit (GE Health Care). The cDNA was quantified by absorbance at 550 nm and 650 nm for Cy3 and Cy5 respectively using ND-1000 Spectrophotometer (NanoDrop technologies, Inc., USA). Hybridization was performed in ASP Base Hybridizer (GE Health Care) for 12 h at 42°C (as par Type 7* slide manufacturer's instruction) using 10 pmol of Cy dye incorporated cDNA of wild-type and mutant, 50 μl of hybridization buffer (GE Health Care) and 100 μl of deionized Formamide (Ambion) per slide. Hybridized Type 7*(star) slides (GE Health Care) were imaged with a Generation III Array Scanner (GE Health Care). The fluorescent signal intensities from each spot on the microarray were quantified using Spotfinder software (GE Health Care). Imaging and microarray analysis was performed as previously reported . For each growth condition at least three independent biological RNA isolations were performed. Samples from each time-point were hybridized as dye swap experiments. To identify differentially expressed genes between the wild-type and mutant strain, we used the Significance Analysis of Microarrays (SAM) program version 2.0 as described in the manual . Briefly, SAM computes a statistic di for each genei measuring the strength of the relationship between gene expression and the response variable. It uses repeated permutations to determine whether the expression of any gene is significantly related to the response and creates a profile of observed versus expected values for each genei. Genes with values outside a user-defined region of this profile are considered to be significantly regulated. Significance for each genei is given as the false discovery rate (FDR). Here, data analysis was conducted with intra- and inter-slide normalized [54, 60], log2-transformed data using the one class method in SAM 2.0 for the following comparisons of four different time points of growth: 1) L. monocytogenes EGD-e versus the deletion mutant ΔsigB at 3 h, 2) L. monocytogenes EGD-e versus the deletion mutant ΔsigB at 4 h, 3) L. monocytogenes EGD-e versus the deletion mutant ΔsigB at 8 h and 4) L. monocytogenes EGD-e versus the deletion mutant ΔsigB at 16 h. To identify σB-dependent genes, a particular genei was considered to be under σB control when (a) the FDR was < 1.0%, (b) the fold change 2-fold up or down regulated in the wild-type compared to the deletion mutant, and (c) when the gene was significantly regulated [see (a) and (b)] in at least two of the four growth conditions tested. Using these criteria, a final set of 216 significantly regulated genes was collated from all four experiments (see Additional file 1, Table 1S and Table 2S). Microarray data have been deposited to ArrayExpress , accession number E-MEXP-1170. Gene annotation was performed using the ERGO bioinformatics suite. To determine Clusters of Orthologous Groups of proteins (COGs) for L. monocytogenes, we used the organism-specific resource for microbial genomes provided by the NCBI webpage  Entrez Genomes. To investigate the specific role of each gene in metabolic pathways, the KEGG database for L. monocytogenes was used as a resource . A consensus binding site for σB GTTT-N13–17-GGGWAW was previously reported based on Hidden Markov model (HMM)-based searches in the genome sequence of L. monocytogenes EGD-e . We used the Gibbs sampling algorithm BIOPROSPECTOR  to search for motifs in the upstream region of the 216 genes identified above. We limited the search to 500 bp of the upstream sequence assuming that the σB-binding sites should not be located further upstream than this distance from the gene under control. We identified the pattern GTTT-N12–17-GGGWAW as a reasonable σB-binding motif. This pattern was used to perform an additional search using the tool fuzznuc from the EMBOSS package . All sequences within 500 bp upstream of a putative σB-dependent gene were tested for the motif, allowing one mismatch. To investigate the role of σB as a transcriptional activator, we examined upstream regions of genes that were determined to be under positive control of σB from the microarray studies. The upstream regions of genes that were up regulated in the microarray experiments in L. monocytogenes EGD-e or down regulated in the isogenic deletion mutant ΔsigB were amplified by PCR using specific primers harboring Bam HI, Pst I or Bgl II restriction endonuclease cleavage sites (see Additional file 1, Table 3S, restriction endonuclease sites are underlined). The PCR fragments were cloned via a Bam HI/Pst I or Bgl II/Pst I restriction digestion into appropriate sites of the shuttle vector pSOG30222 (Fig. 1S, see supplementary material)  as a transcriptional fusion to the promotorless bgaB reporter gene and transformed into E. coli InvαF' electrocompetent cells. The insertion to the promotorless bgaB reporter gene was confirmed by sequencing, using primers pSOG30222for and pSOG30222rev (see Additional file 1, Table 3S). Recombinants were introduced both into the L. monocytogenes wild-type and its isogenic deletion mutant ΔsigB. The resulting strains were grown overnight (16 h) in brain heart infusion broth BHI (Difco) with erythromycin added to a final concentration of 5 μg/ml at 37°C, followed by measurement of the β-galactosidase activity. The vector without any promoter served as a negative control. β-galactosidase assay experimental procedures were performed as originally described by Miller  and were optimised for the quantification of BgaB from B. stearothermophilus as reported by Schrogel & Allmannsberger . Measurement of β-galactosidase activity was performed in triplicate using 500 μl of cell suspension and 300 μl of buffer B. The criterion for significant σB-dependence of the promoters was set to at least 2-fold up regulation of the activity in the wild-type compared to its deletion mutant or vice versa. Homologs and orthologs in B. subtilis were determined by BLASTP results of the ProtTable for L. monocytogenes . Torsten Hain, Hamid Hossain, Som S Chatterjee contributed equally to this work. We thank Alexandra Amend-Förster, Nelli Schklarenko and Kornelia Kirchner for excellent technical assistance and Dr. Jochen Wilhelm for useful discussions. This work was supported by funds obtained from the European Union (REALIS; QLG2-CT-1999-00932), DFG (SFB535 TP 14) and the BMBF (ERANET Pathogenomics 0313939A) to T.H. and T.C. TH and TC designed the research project. SH contributed to microarray probe design. TH constructed the L. monocytogenes EGD-e DNA microarray. SW provided the sigB deletion mutant. TH and SSC performed microarray experiments and TH, SSC, SO, UV and TC analyzed the microarray data. UV and SO provided the β-galactosidase gene reporter fusion experiments. JPF, SM and SE participated in the preparation of antibodies and immuno-blot analysis. BB and HH supported statistical evaluation of microarray data. AB and CTK were responsible for bioinformatic analysis of the experimental data. TH, HH, SSC, SO, UV and TC drafted the manuscript. All authors approved and read the final manuscript.